Perfect for smaller mirrorless cameras. The Zhiyun-Tech Crane-M is a smaller, lighter version of the original Crane. It is designed for small mirrorless cameras, smartphones, and action cameras weighing between 125g and 700g At the same time, it has the advanced features of the original as well as improvements over it. (Separately sold adapters from Zhiyun Tech are required for mounting phones and action cams.) The Crane-M provides 360° rotation along the pan, tilt, and roll axes via a large 4-way joystick. It can also be controlled remotely over Bluetooth using the free Zhiyun Assistant app from your mobile device (iOS/Android). The Crane-M operates on 32-bit triple-MCUs running in parallel at 4 kHz frequency. It also features brushless motors offering high accuracy while maintaining low vibration and increasing torque. Accuracy is ensured with a magnetic encoder in each motor and advanced stabilization algorithms. The Crane-M can achieve up to 0.01° of accuracy within 0.25 millisecond. Multiple modes are available to select from. In Lock Mode, all three axes work together to keep the camera pointed in one position. The camera will stay still no matter how you move the handle. In Yaw-Axis Follow Mode, the Crane-M will only follow your pan movements, while in Pitch/Yaw-Axis Follow Mode, it will follow your pan and tilt movements. You can also switch to Inverted Mode at any time by simply flipping the handle over the camera. Inverted mode can be operated in conjunction with the Lock and Follow modes. In addition, the gimbal also has a Camera Control function with which shutter release can conveniently be triggered over a USB cable for select Sony cameras. A 1/4"-20 mounting thread on the bottom of the gimbal allows mounting on tripods, monopods, and other support gear. Having the Crane-M mounted is also the ideal way of using it when controlling it remotely over the mobile app. The Crane-M runs for approximately 12 hours on included 26500 lithium-ion batteries, which take about 3 hours to fully charge. Two-Handed: Uses the included handlebar and both handgrips for a standard two-handed configuration, with the camera suspended below the handlebar. Two-Handed Inverted: Positions the camera above the handlebar, allowing you to capture eye-level footage while keeping your arms in a more natural position. Single-Handed: Uses a single handgrip above the gimbal that functions like a standard top-handle. This setup is ideal for low-angle shooting. 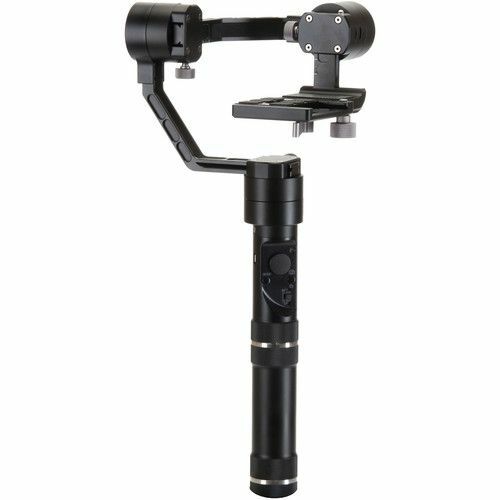 Single-Handed Upright: Places the gimbal directly on top of a single hand grip for a traditional single-handed gimbal stabilizer design. Panning Mode: The camera is allowed to pan left or right. Vertical tilts or rolls are restricted. Panning and Tilting Mode: The camera is allowed to pan left or right and tilt up and down. Rolls are restricted. Lock Mode: The camera stays in its current orientation. All panning, tilting, and rolls are restricted.